No-Butter Fried Rice (Vegan), Margherita Grilled Cheese, and a Revelation: Eating Healthier Can Taste Better! Cookin’ Up Summertime Favorites: Homemade BBQ Sauce & Foil Potatoes! Cookin’ Out this Memorial Day Weekend with Dutch Ovens and Foil Dinners! Coming up with new ways to use the same old ingredients is kind of a hobby for me. I like to change things up a bit in my kitchen, and last week I stumbled upon something brilliant -Bacon Cheeseburger Mac & Cheese! Now I’ve added hamburger and onions to regular Kraft macaroni and cheese before, but I thought, ‘why not add some more ingredients to round out this meal?’ Thus adding everything you’d get on a cheeseburger to mac & cheese. 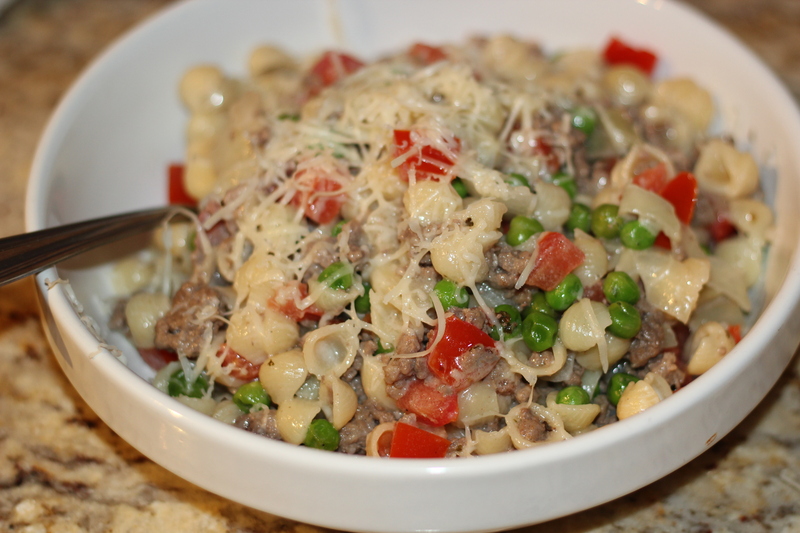 This simple mac & cheese dish is a perfect way to add some veggies to your family’s dinner, and use up all of that ground beef. Your kids will be surprised how good it is, and you’ll be surprised how fast you just made dinner! 1. 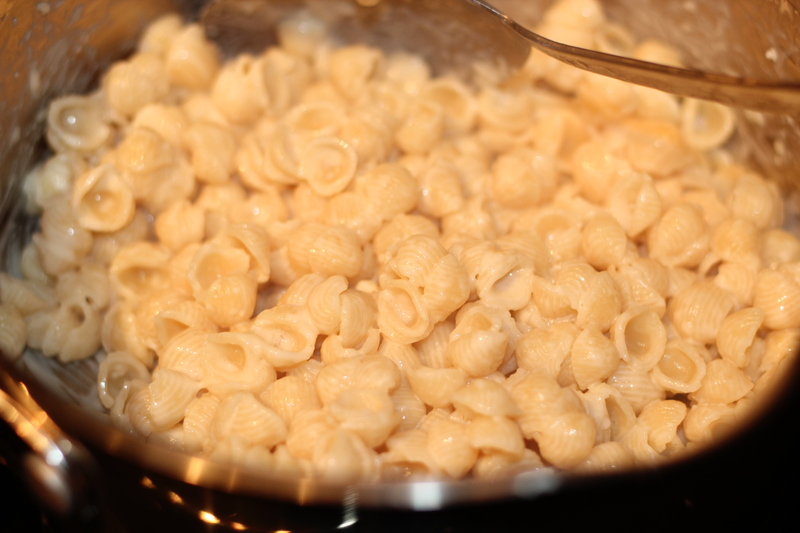 Make the Mac & Cheese as directed. While the water is heating to a boil for your pasta, begin to cook the ground beef on medium-high heat in a separate skillet. Add the pieces of Bacon and 1/2 of a diced onion to the ground beef. 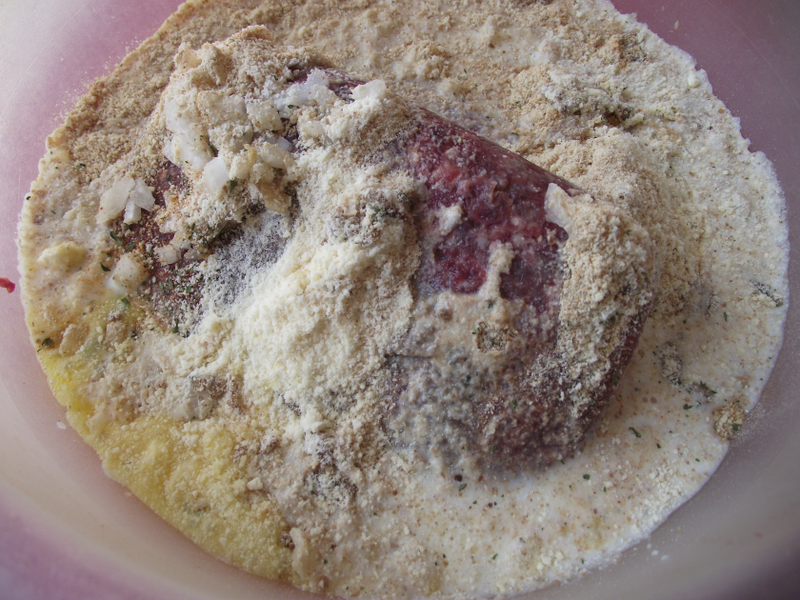 If your beef and bacon are creating a lot of grease go ahead and drain the mixture before continuing. 2. Once the the beef is beginning to brown add the frozen peas. 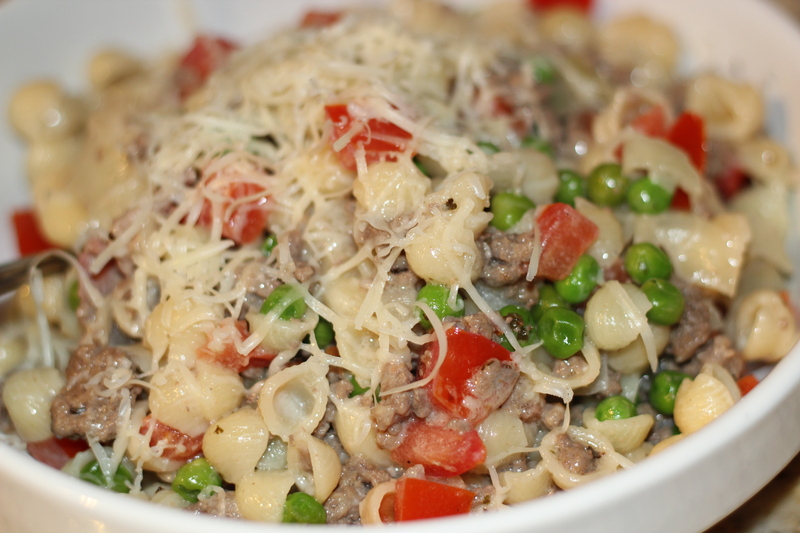 Allow to cook until the peas are nearly cooked and the beef and bacon are thoroughly cooked. At the same time, finish making the mac & cheese as directed on the box. 3. 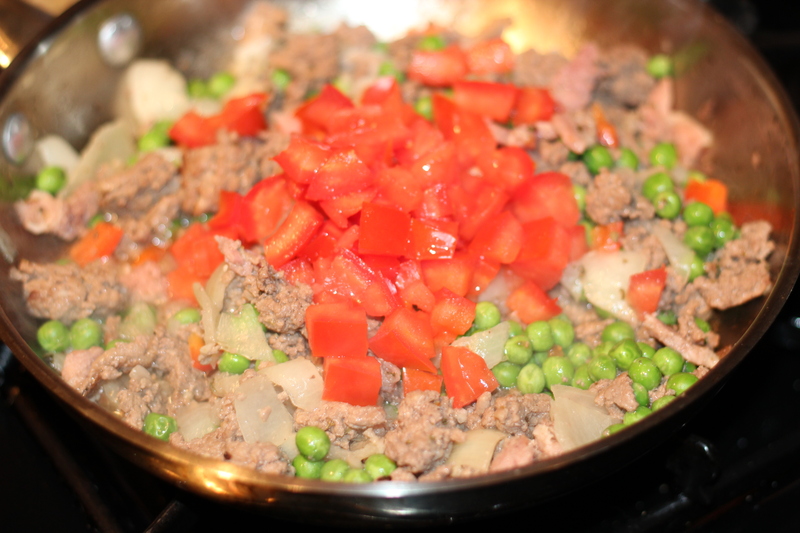 At the last minute add your fresh tomatoes and season the beef mixture to taste. Add the prepared mac & cheese to the cheeseburger mixture. Add additional shredded cheese if desired, and enjoy! Tip: We also added some red pepper flakes to our mac for a little kick. Ground Beef. It’s boring all by itself and I have a ton of it in my freezer because we stocked up by purchasing a huge part of a cow from my Father-in-law’s farm. Smart on my part because I’m a penny pincher, remember (Simple and Frugal Granola). And not-so-smart, because now I have to become a magician, wave my magic wooden spoon, and make hundreds of dishes out of ground beef that my whole family will eat…and actually ENJOY eating. My hubs is a man’s man. He’s a meat and potoates kinda guy. Hmmmmm, what to make him??? Then it came to me. Meatloaf! Every time I make meatloaf I do something different. I also tend to find something lacking that needs to be fixed each time. But not this time!!! I am happy to report I’ve found a keeper! And it couldn’t be a more simple recipe. 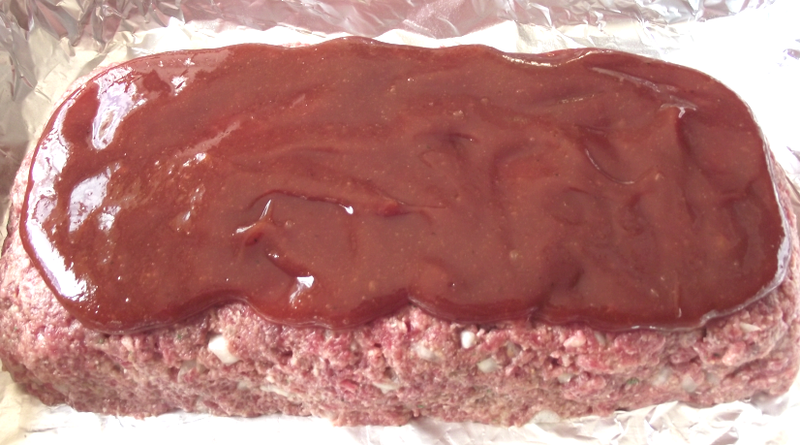 The key to great meatloaf is to not overmix your ingredients. 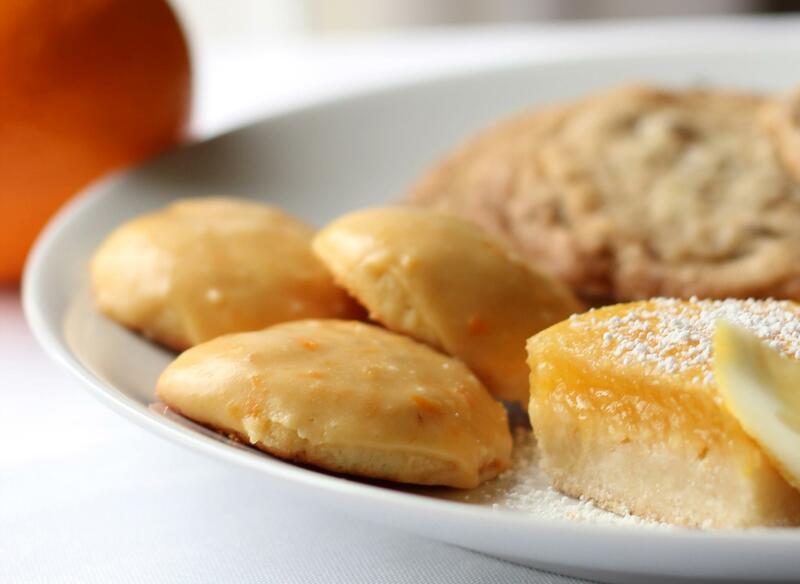 Keep it light and fluffy. Try it and you’ll see the difference! You’ll have a moist and tender loaf of meat your whole family will scarf down, and will be asking for seconds before you know it! 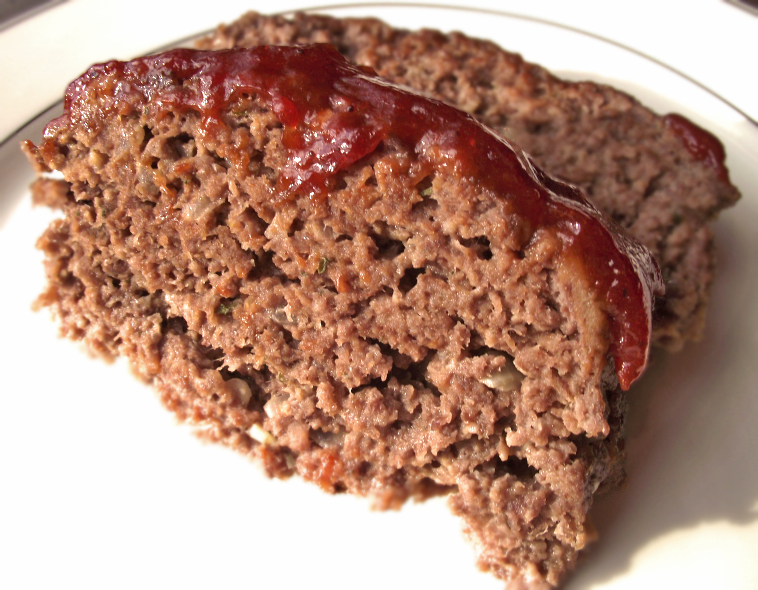 A super simple meatloaf recipe your whole family will enjoy! 1. Preheat oven to 350° F. Line a 9×13” baking pan with aluminum foil and spray with cooking spray. Set aside. 2. 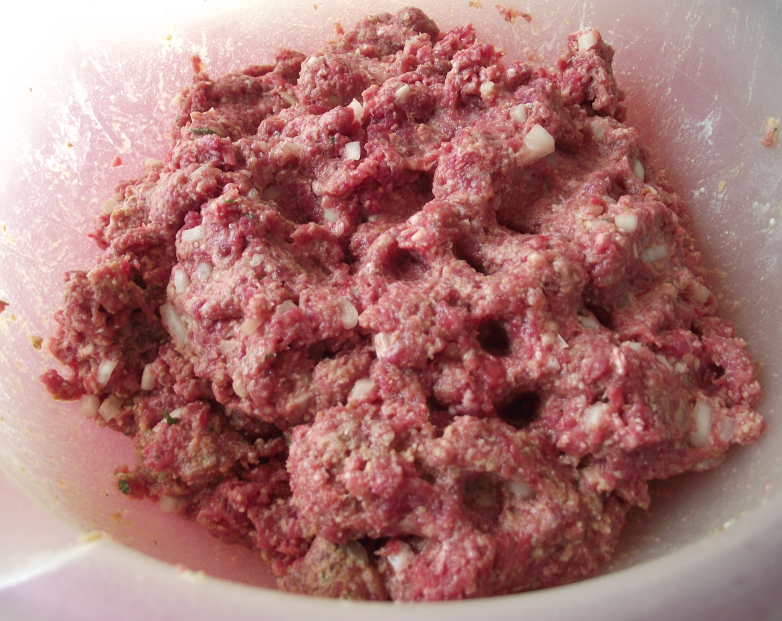 In a large bowl, combine ground beef, egg, onion, milk, bread crumbs, parmesan cheese, seasoned salt, parsley, garlic, and Worcestershire sauce. Mix thoroughly but with a light, gentle hand. 3. Turn out onto baking pan and form into loaf. 4. 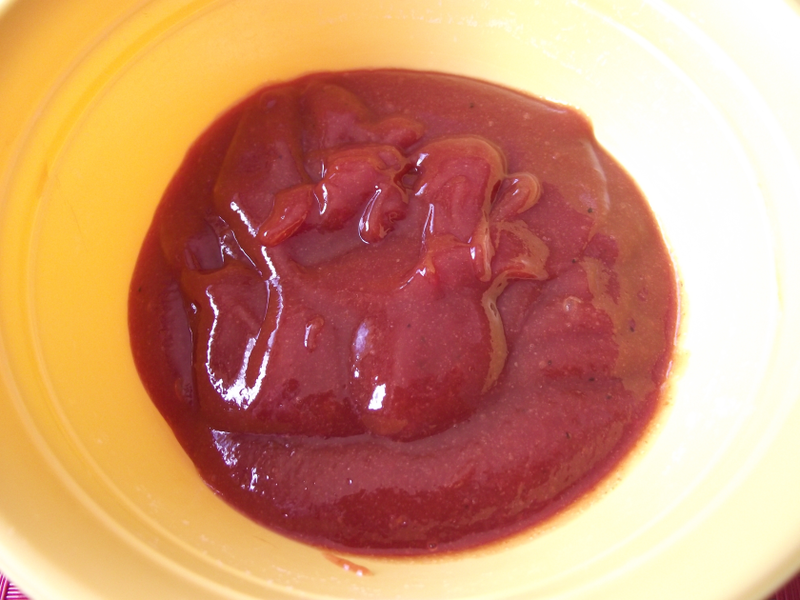 In a separate small bowl, combine brown sugar, ketchup, bbq sauce, and ground mustard together. Mix well. Pour over the top of the meatloaf. 5. Bake meatloaf for approximately 60-70 minutes or until your meat thermometer, when inserted in the center of the meatloaf, reads 160-165° F.
Tip: After you’ve taken the meatloaf out of the oven, allow it to rest for 5-10 minutes with a foil tent placed over the top of pan before cutting it. This allows the juices to redistribute throughout the meatloaf. Serve this Meatloaf up with your favorite potato recipe, like baked, mashed, or even our Cheesy Potato Casserole. Oh and another veggie would round out this meal! 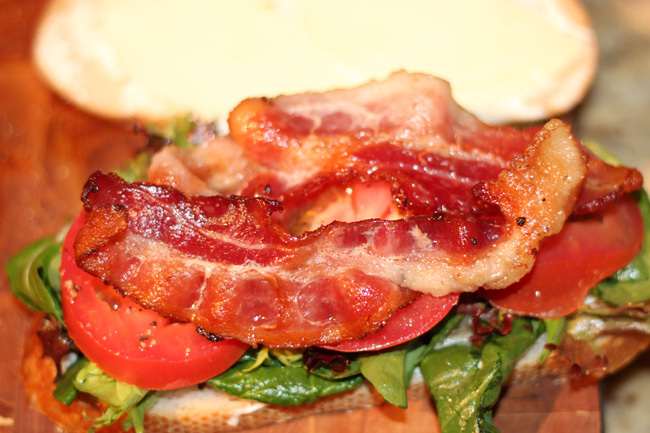 Dressing Up Dinner in a Flash: Making the Best BLTs in 1-2-3! You may be thinking, ‘Um, BLT? 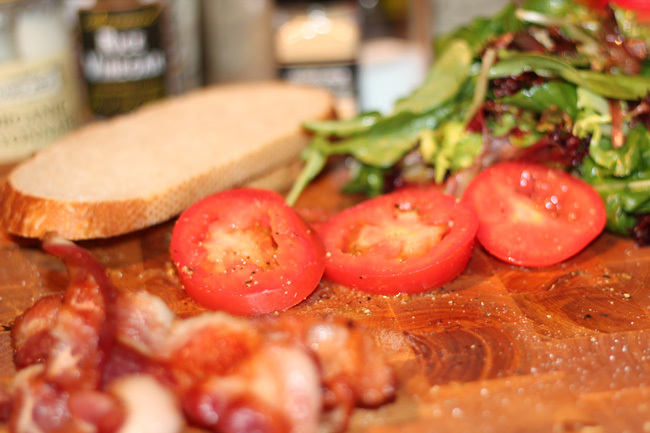 Isn’t that just throwing Bacon, Lettuce and Tomato on bread?’ No, no, nooo…Don’t just do that! I mean you can, but if you want an awesome BLT and some great flavor you’ll want to read this! 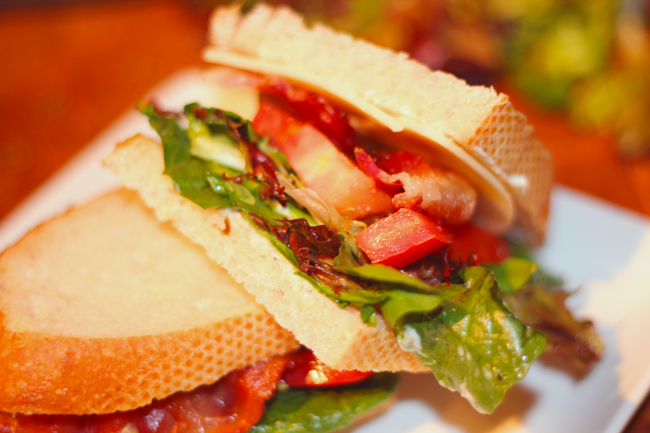 I’ll show you a couple quick steps to making the BLT your favorite sandwich, and I swear it will only take you an extra 60 seconds!… These steps are so great, they made my hubby -who hates fresh tomatoes on anything- devour these BLTs! Step two is first finding the best -perfectly ripe- on the vine tomatoes. Then slice your tomatoes about 1/4″ thick and season them up. Yes, that’s right season your tomatoes! Who would have thought? I liberally salt and pepper both sides of each slice, and then I give a light sprinkling of garlic powder to each side as well. the best tomatoes paired with a bit of flavor really makes this sandwich sing, yummm! Step three is dressing your greens. Yes you can just through iceberg lettuce on any old sandwich and call it good. But that’s not good if you want great! So start by using a fresh bag of baby greens or other variety of dark leafy greens as your lettuce. Then add about 1-2 Tbs to taste of Rice Vinegar (or apple cider vinegar works great), and a little fresh cracked pepper. Then once your bacon is cooked take 1 Tbs. of the bacon drippings and spoon in over your lettuce. Toss your greens really well and make sure they’re to your taste. This way you can use all of those tasty greens on your sandwiches and then eat what’s left over as a salad on the side! Genius! And oh so good! Then all that is left to do is assembling your sandwiches. Put as much bacon, lettuce, and tomato as you want on yours. 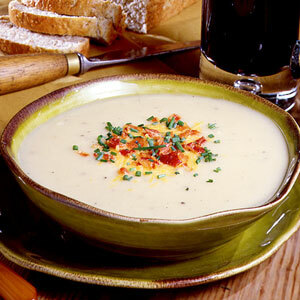 And if we’re having these for dinner I will add a slice of cheese to mine like provolone, swiss, or cheddar. 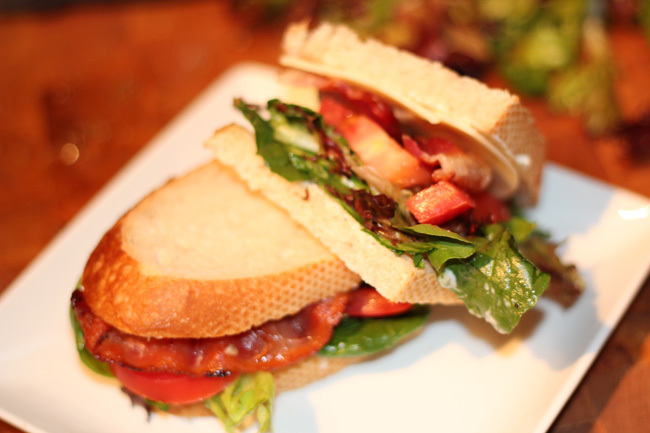 Enjoy your new and improved BLT’s and tell your friends! Also, all of these little tips can help wake up any mundane sandwich. Try them out for your next packed lunch and I promise you won’t be disappointed! Yay for warmer weather and fresh produce! Loaded Potato Soup via Leftovers!